Welcome to the very first recipe I’m posting from Ina Garten’s upcoming new cookbook, How Easy Is That? ! Be sure you check back in the next 2 weeks for two more very new and very fabulous Ina recipes in anticipation of my interview with her on August 19th (new date). Or better yet…Follow Me @smellslikehome … or take a trip over to Smells Like Home’s Facebook page for all of the newest updates and fun chitchat. So the verdict on these Spicy Turkey Meatballs? We’re still raving about them now over a week since we made them. Hands down, we loved them and Kyle (the one who worked as a cook at an Italian restaurant) said with full conviction that these were the best meatballs he’s ever had. And to reveal something else, we made them will all ground turkey and without any ground pork. To make up for the loss of the traditional ground pork flavor, I added about 1/4 teaspoon ground fennel and 1/2 teaspoon fennel seed. This always seems to do the trick when trying to make the gobble taste like an oink. The original recipe is below and if you’re wondering, yes, I have permission to post it. We couldn’t have been happier with our first choice from How Easy Is That? and I’m thrilled to dig into the next one! My sincere thanks goes out to Ina and her cookbook publicist, Carrie Bachman for extending the opportunity to me to test run this book. I hope to do these recipes justice! I just love Ina. Can you ask her this–how does she feel about someone making their own birthday cake. Faux paux or great idea? I don’t eat beef and at best i’m usually disappointed with turkey meatballs…this recipe sounds so very very good!! I can’t wait to see your interview with Ina! I’d ask Ina what her one overriding principle for successful entertaining, if she could please just narrow it to one, would be. I’d ask her the same question in regard to cooking and food… one overriding principle for success, from her point of view. Sounds like fun to sit with Ina. Her books are great; many of my old stand-by’s were inspired by them. 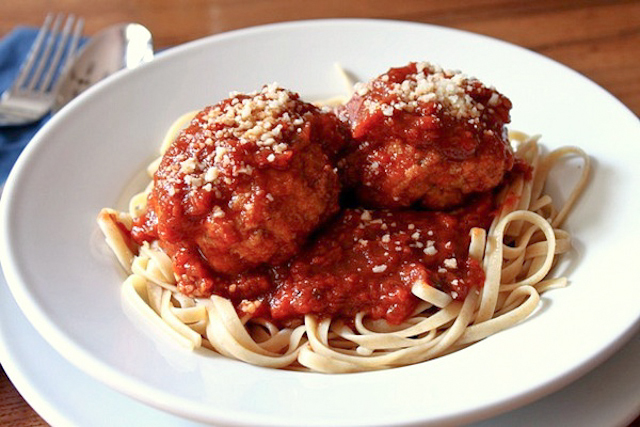 And this meatball and spaghetti recipe makes me definitely want the new book! I made these meatballs today. I used all ground turkey and they are delicious! I didn’t have any fennel seed but I think that would have made them even better. My gobble didn’t taste quite enough like oink! So glad you liked them Tracie! Thanks for letting me know how they were! About the round rustic bread….can I just use an italian bread if I can’t find a “round rustic bread” and would I have to toast it first to get the proper crumbs? I assume a fresh loaf wouldn’t do to well in the processor?? Thank you, can’t wait to make these. I love Ina! LeeLee: You can definitely use Italian bread – I’ve used ciabatta bread as well and a loaf of French bread would be ok too. Either toast the bread or let it get stale on the counter for a day or two before you put it in the food processor. I hope you love these meatballs as much as we do!! Sounds delicious. I would like to know how many servings this recipe yields . Thank you. Carol: This recipe yields 8 servings. I have the cookbook and I’m making them now. Beside the prosciutto it says “see note” but the only note I see is for the Asiago. Can you please tell me what the see note is?! I have every Barefoot Contessa cookbook and she has inspired me to be in the kitchen!! Thank you Ina and smells like home. Adrienne: There is a note about the prosciutto in the left column of the first page of the recipe. Came across this post because of the question Adrienne asked… my cookbook actually does not have a note in the left column of the first page of the recipe. Maybe an error at the printer? I too have been trying to figure out what the note is for prosciutto! If anyone knows, could they share?! Jill: The comment says to make sure you remove and discard the rind from the prosciutto before using it in the recipe. I made these meatballs tonight. Only exception is that I used ground turkey breast (with the sausage and olive oil I thought they would stay moist) and I had just a tab more prosciutto, so threw it in. They were fantastic! Loved the spicy kick of the red pepper. My husband said…”this may be the best meatball I ever had.” Thanks for posting! mwhets: My husband had the same reaction! So glad you enjoyed them as much as we do! Im a 36 yr old woman, who is just learning how to cook. My aunt gave me this book in April, 2011. I have made a lot of recipes, but I have to say, the meatball recipe is make favorite. My dad loves them, and since it is just us two in the house – we have a lot of leftovers to freeze! Having lunch with some that I made last week! My mom always said that she loved Ina’s recipes, and now that I have tried them myself, I couldnt agree more!!!! If I were to make this without any italian pork sausage or proscuitto what would you suggest as substitution? We’ve made these meatballs with all turkey and they were still great. You might want to add a little olive oil to the mix before shaping them. I hope you love them as much as we do! Chicken Chow Mein…or is it Chop Suey? ?